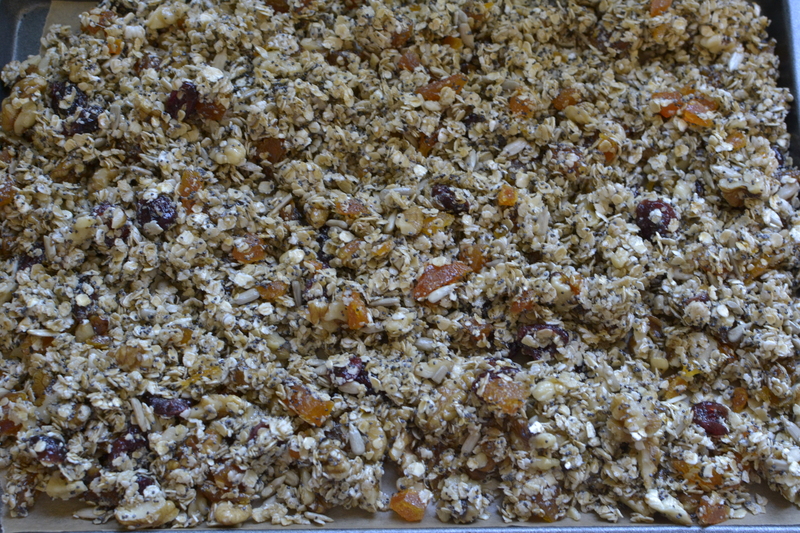 Originally I made this granola when the Princess was visiting. She criticised me for making an excessive amount and then we finished it in like a week. The same happened when I made it again recently. It’s ridiculously addictive and is filling breakfast food. I don’t feel the need for lunch til at least 3pm… It’s also super easy to make and the only requirement is that you don’t forget it is in the oven (yes I did that) because the fruit gets a tad dry (in a will-break-your-teeth kind of way). Feel free to put what you like into it – I made apricot, cranberry and walnut this time but really, the choice is yours. Toss everything together in a large bowl. If you’re worried about the fruit burning, leave it out of the initial mix and add it onto the baking trays when you’ve got 10 minutes left. Spread the granola out over two lined baking trays and bake at 180C for 30 minutes, stirring everything and tossing it around every 10 minutes. Allow it to cool before storing in an airtight container. Eat with milk/yoghurt/as a snack.